We got an email from James Brown at the weekend. 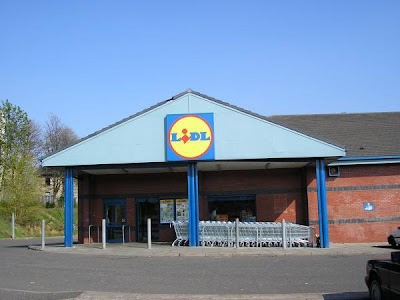 (Not the godfather of soul one RIP but another one who also it seems has his brushes with fame) James was alerting us to the fact that Somerfield on Victoria Road is to close its doors on the 28 February and reopen as a Lidl at the beginning of March. James has a great post on his site about his experiences and thoughts on Somerfield here. Got to admit I agree with him on Somerfield - it is the scafiest looking of all the supers closely followed by Morrisons - all that black and yellow, its like the shop is run by bees. Can't say I think too much of Lidl's graphics or colours scheme (see above) they tend to look like they have been made out of the cheapest material they could find and look about as attractive as a mechnao kit - why are so many supermarkets so badly designed graphically? Does that make us buy more food? Again I agree with James, the Co-op also gets my vote - its pretty nicely designed inside and the food is pretty good value and is reasonably ethical in its sourcing. I've not really had much experience with Lidl, when they first opened in Scotland I did pop into one but through oddly displayed pricing I ended up buying an advent calender for £9 when I thought it was only 60p. It was very nice though with 3cm high 3D moulded chocolate figures each day that I felt guilty to eat - especially the little chocolate baby Jesus, he looked so sad - but was very tasty. what have you got against bees then? Whats black and yellow and goes toot toot?